It is accompanied by Stompas Curve desk which offers a practical surface and storage solution for them to work and create. Made from MDF and oak, both the bed and desk feature smooth curved lines, rounded edges and an attractive white and oak finish, making this durable set a safe an attractive addition to their room. It provides four deep compartments perfect for storing books, toys and craft materials. Featuring two hinged, white lacquered doors with inset handles, the other two spaces enable you to quickly stash and hide away clutter. 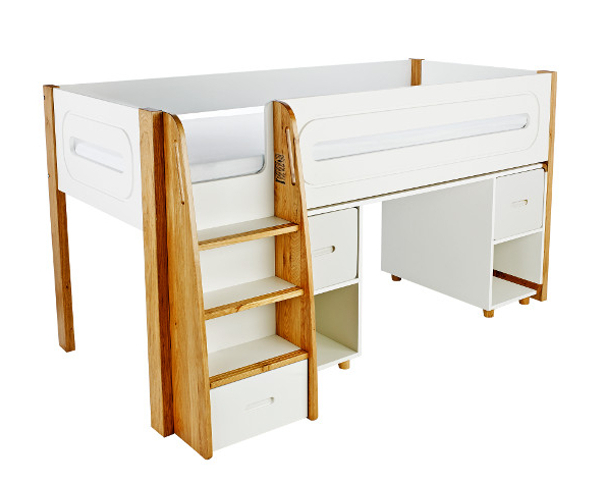 Includes Curve Midsleeper and Large Desk with a pair of white lacquered doors.